After two decades of standards-based reform, a new education paradigm has begun to take hold -- the rise of competency education. This new vision builds on the strong foundation of new college and career ready standards, challenging stakeholders to design an education system that emphasizes mastery of content standards and the transferable skills critical to success in college and today's workforce. A competency education system puts students at the center, replacing rigid time-based structures with flexible learning environments that ensure students receive the support and extra time they need to succeed. This highly-personalized approach provides clear, individualized pathways to student proficiency that help mobilize stakeholders around the collective goal of college and career readiness for all students. 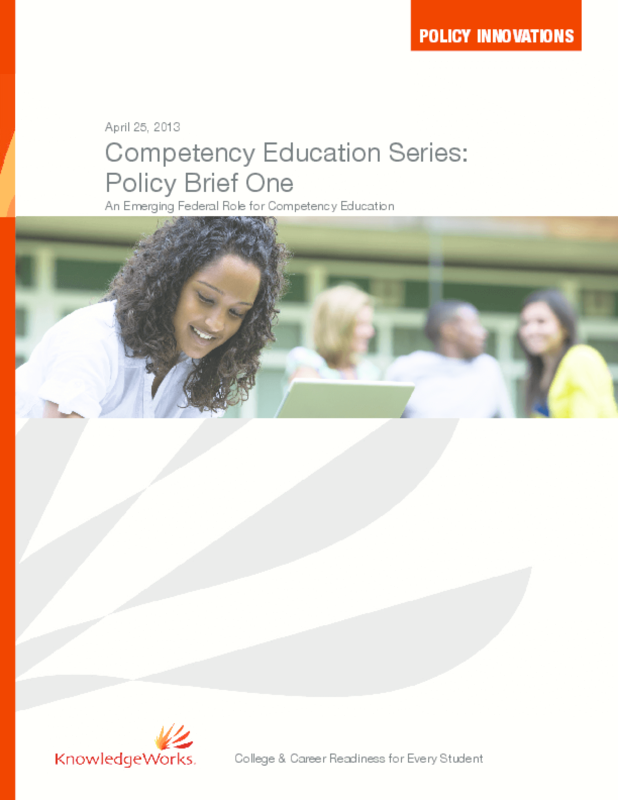 A growing number of states and districts have begun to embrace this vision for education, leading to an explosion of new policies, pilot initiatives, and tools designed to help schools implement competencybased approaches.The success of the competency movement depends heavily on the federal government's willingness to partner with states and districts as they design education systems that put students at the center. A true partnership will grant states the flexibility to innovate and develop equally ambitious accountability and assessment policies that better align with student centered education to ensure all students graduate with the knowledge and skills to succeed. This paper is the first in a series to help policymakers define the appropriate role for the federal government supporting competency education in the nation's K-12 schools.